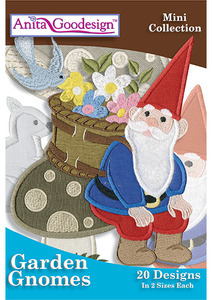 You will adore these whimsical applique Garden Gnomes that we designed just for you! There are 20 different Garden Gnomes and they come in two different sizes each. They are all captured in playful poses and since they are all created using appliqué they stitch out quickly. We embroidered the Gnomes using traditional red and blue fabric but you can choose any colors that you like. Since the designs aren’t that stitch intensive you will only need a piece of tear-away stabilizer to stitch the designs. Collection contains 40 designs total for the 5”x 7”, 6”x 10” and 8”x 12” hoops.